Spending five decades with someone you really love is just a short time to count. Golden anniversary is one of the most celebrated events. It is a great milestone for a couple to reach their 50th year together, staying married and keeping their love on fire. 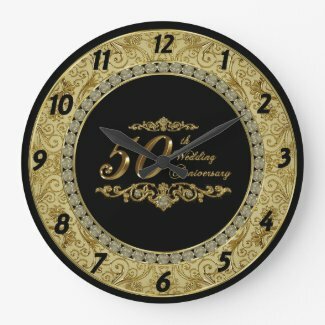 Gold symbolizes 50th wedding anniversaries. A marriage that is strong will surpass all the trials a marriage may encounter. Just like gold; they are beautiful and expensive and at the same time they are also strong and resistant to corrosion just like how your parents resist temptations and trials that will weaken their marriage. Here are some gift suggestions that will make this day even more special. A perfect date awaits your parents. Give them a romantic wine dinner on their 50th wedding anniversary celebration. They will be spending a splendid night at Nashville’s top Wine Bar where in they will experience a fantastic wine pairing night created just for the two of them. They will enjoy a custom four course menu that compliments with a distinct blend of Italian and South American taste. These wine compliments well with each course prepared for them just like how their marriage is. They wouldn’t be celebrating their golden anniversary if they are not meant for each other. This is such a special gift for your parents’ golden anniversary. This is not just a regular framed poem. This poem is a masterpiece of a nationally recognized poet, Genie Graveline. 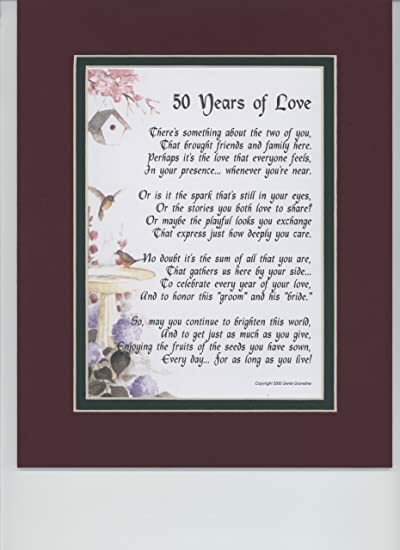 This poem is printed in high quality double-matted mats. It is also artistically enhanced watercolor graphics. This gift item will surely last for years. It is something to remind them of how wonderful their marriage is. They had reached their 50th wedding anniversary with their teamwork and their never ending love for each other. This will definitely love this wonderful gift. 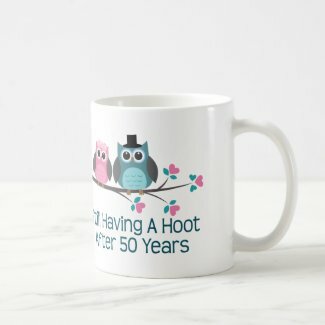 This pair of owls looks really cute together, they look smart and romantic together, just like your parents, and their marriage becomes smarter and stronger as time passes by. This gift idea will remind them every day how great their marriage become. Let them start their day with a romantic breakfast with an identical mug on their breakfast table. They will surely love to share a hot drink to wake them up in the morning or to keep them warm on cold nights. Gifts doesn’t need to be too expensive, it is the thought that counts. This is a keepsake that will always remind them how great their marriage has become. They had planted a seed and made it grow into a strong and fruitful tree. Their 50th wedding anniversary is not just an ordinary celebration. Not all marriages reached this long, not every couple have the chance to celebrate their golden anniversary beside each other. Don’t let this opportunity to fly away. This porcelain plate is the best gift idea and this will always remind them of their wonderful journey together. Most couples renew their vows on their 50th wedding anniversary, so why not sponsor their rings? 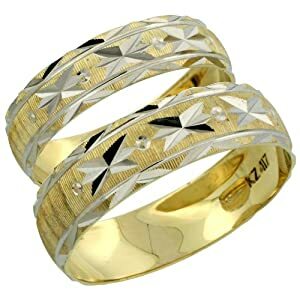 A pair of golden wedding band will be a great and memorable gift they can wear and cherish for the rest of their lives. Are you looking for a romantic gift for your parents on their 50th wedding anniversary celebration? This must be the gift you are looking for. This is a perfect night out for them. This New Jersey dinner cruise gives them a magical ambiance that will keep the fire of their romance burning. They will surely enjoy a freshly prepared cuisine associated with a live music where they can also dance under the shimmering stars. This is the best gift you can give your parents and they won’t forget. Why don’t you bring your parents’ 50th anniversary to the next level? Instead of the usual celebration like dinner by candle light or big family gatherings why don’t you let them experience a different way of celebrating a wonderful day of their married life? They will enjoy a picturesque helicopter tour. Let them have a relaxing dinner while mesmerizing the sunset tour on a helicopter ride. Just let them imagine it is a romantic magic carpet ride as they rekindle their romance of 50 years. This is the time to show off the great milestone your parents’ marriage has reached. This gift idea is specially designed by Digitalbcon Images Design. They feature a gold and black colored theme that has custom images and patterns. This will look elegant on their living room displaying its attractive design. This is a perfect gift for couples celebrating their 50th wedding anniversary. Make their anniversary celebration even more special with a romantic toast of champagne. This set of 2 champagne flutes is a perfect gift for couples celebrating their wedding anniversary. 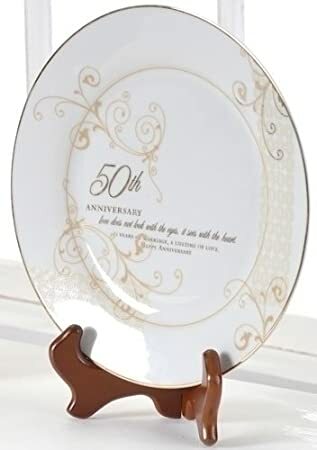 It has a glazed porcelain stem that has a sculpted rose and leaf accent and what makes this gift idea extra special is the “50th” gold tone accent on it. The flutes are 9 ½ inch tall and has a classy design. 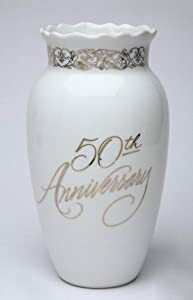 This 50th anniversary vase made of white porcelain and has a gold design that reads “50th Anniversary.” This gift idea can be displayed at a 50th anniversary party and afterwards a keepsake to remind your parents of their wonderful milestone. You can wrap it or just simply display it with a bunch of fresh beautiful flowers. Your parents will surely be in love with this white porcelain vase with a stylish gold border. This gift idea can also be associated with a couple shirts or a commemorative 50th anniversary plate. Credit for intro photo: Ian Mackenzie aka BraveNewTraveler from Flickr.com. An anniversary sundial is a good choice – we have one that sits on the windowsill and makes rainbows in the room – and it has a custom date line for our anniversary that the tip of the time shadow follows on our special day each year! Thanks! It does look great! I believe I recommended it in another article.